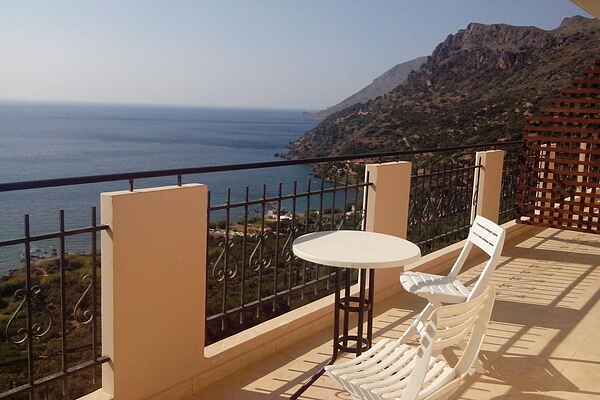 Seaview Studio 1, on a green hill in the traditional village Ravdoucha, offers panoramic views over the Cretan Sea. A perfect get-away to unwind without the tourist crowds. If you are looking for quiet holidays far away from the mass tourism, this 40 sq. m studio can accommodate up to 3 persons. It has 1 double bedroom, sitting area, fully equipped kitchen, bathroom with shower and a huge balcony of 15 sq. m. with fantastic sea views. A 3rd person can conveniently sleep on the sofa bed. 2 Fans in the house, living room and bedroom.